If you want to pull a big load, you've got to have a strong chain. I am reading The Score Takes Care Of Itself by Bill Walsh with Steve Jamison and Craig Walsh. As I was reading this morning, the excerpt below stood out. It reflects both what the Lord teaches us about our service together for him, and who we are as the Spanish River Church family--the people, pastors, staff, school staff, elders, deacons, other leaders at SRC. On the field (and elsewhere) the assistant coaches and I were conscientious about educating players so they appreciated that when Jerry Rice caught a touchdown pass he was not solely responsible, but an extension of others--including those who blocked the pass rushers, receivers who meticulously coordinated their routes to draw defenders away from him, and the quarterback who risked being knocked unconscious attempting to throw the perfect pass. Jerry was taught the same. Likewise, Joe Montana understood that he was not some independent operator, but an extensions of the left tackle's block and the efforts of many others. The words of Walsh bring to mind our Lord's teaching through Paul, about the interdependent nature of the body of Christ. One of my favorite summaries of this interdependent working is found in 1 Corinthians 3:9. Paul writes,For we are God's fellow workers. 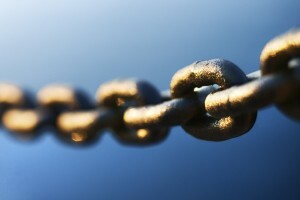 This morning I am grateful for all the "links" that make up the strong chain that is Spanish River Church. You are pulling a big load for God. It is a privilege and a joy to be a part of that chain and pulling together with you!